Pets Considered. Dogs under 30 Pounds are allowed with a $250 Pet fee. Not your typical Wildwood Condo. Large open floor plan with all the upgrades. This beautiful like new 3 Bedroom, 2 Bath condominium is located just two short blocks to the popular Wildwood beach. Beaches voted #1 in NJ. This unit features 1 floors of luxurious living, deck with views, central air, private washer and dryer, dishwasher, parking for three cars, Storage unit and a lot more! Call now to reserve your vacation!!! Weekly rental Saturday to Saturday!!! Weekends considered in off-season three night minimum. Please inquire about rates. Bed Spreads and Pillows are supplied. For your convenience please bring beach/bath towels, linens, laundry detergent, and paper goods. Please leave the condo as you found it, with all items cleaned and put away. A professional cleaning service will be in shortly after check-out to prepare the unit for the next tenants. Please ensure TRASH and RECYCLING are taken out during your stay. Failure to do so will result in an additional $50 Trash Fee. Booking your Vacation rental through a licensed New Jersey Real Estate Agency can help you save money. Tenants booking through a Licensed NJ Real Estate Agent do not have to pay the New Jersey accommodations tax. This tax can be between 12 and 20 percent depending on location. I am a Real Estate Agent with Keller Williams Jersey Shore Handling the rentals for the owner. Great Location centrally located to boardwalk, Beach, Shops, Restaurants, Mini Golf, Bars, Brewery and convention center. When we arrived at the condo we had a hard time getting in. The keys in the lock box wouldn’t open the back door that the box was on. We went back out front to try entering from the garage. There was a small box with a key pad. We tried over and over entering the code we were given but it wouldn’t open. I finally tried calling Richard the realtor on his cell but he didn’t answer. I then called the real estate office and no answer there either... We finally realized there was another key pad which was covered. Once we got in, we realized we had to share the garage with the upstairs tenants and the entry to the two units was filthy. I would guess it’s never been cleaned from day one. The unit itself was very nice and clean. Everything worked great and the master bed was very comfortable and the A/C worked exceptionally well. The balcony was very big but on a very busy, noisy street, but you couldn’t hear the traffic inside the condo. Our biggest complaint was the upstairs tenants. They were very quiet all day and went out around 11 each night. They would come home between 3 & 4am every night waking us up going up the stairs and then walking around above us. The third night they came home at 3:15 and started arguing, stomping around and then blasted music until 6am. They were also throwing their ashes and cigarette butts on our new car. By the 4th day, us and the neighbors next to them (who were the owners) said something to them and things got better. Except for the dirty entry we do realize these are things the owners can’t control for the most part so please take my review with a grain of salt. As I said before, the condo was very nice and comfortable inside. We just had a bad experience and I am not sure we would rent this property again especially for what we paid for it. Thank you for the positive comments about the unit. I am sorry to hear about the tenant issue in the unit above you. I have addressed the issue with the owners and tenants. The owners have been made aware of the common area issues and are going to address for next year. I will be sure to make the check-in instructions more clear as to where all the items are located. I thought I was very responsive to you phone call that Saturday and was on my way to address when you called and told me you had gotten access. I try to be as prompt as possible. If you do decide to stay again we would love to have you again. I was very pleased with the place. We had plenty of room for everyone. We had a very comfortable stay the beds were very comfortable the kitchen had everything we needed plenty of parking. Thank you for the kind feedback. We wold love to have you back again in the future. We had an amazing week in Wildwood. condo was very clean, nicely decorated. All the comforts of home. Will definitely rent again. Thank you for your kind feedback. I am glad you had a great vacation. We look forward to having you again soon. Beautiful condo with every possible convenience! It is very clean and spacious which made for a relaxing trip to the beach. Short walk to the beach. It was also great to have off street/garage parking. We will definitely recommend to our family and friends. 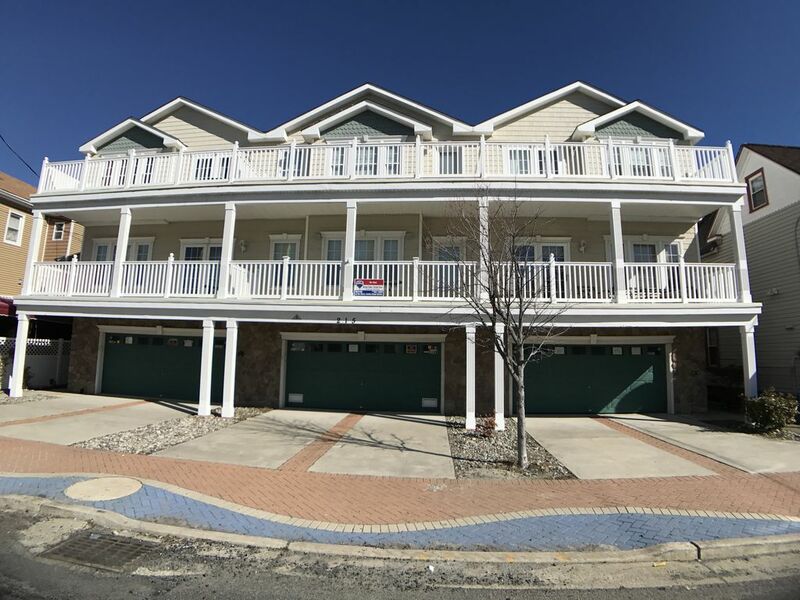 Located just two block to the Beach and within walking distance to the Wildwood Convention Center. All Rates are weekly. There is a $50 processing fee for all leases. Payments are 50 percent due at the time of booking and 50 percent due 30 days prior to check-in. All fees are due with the initial payment.